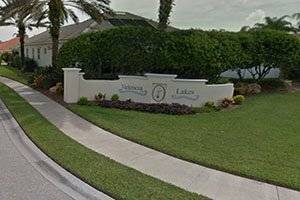 Valencia Lakes is a small community located on the north side of East Venice Avenue, less than quarter of a mile west of the Jacaranda Boulevard roundabout, a landmark for many buying destinations of homes for sale in Venice and south Sarasota County. This community is in a popular area, being adjacent west of the well-developed Venice Palms acreage. 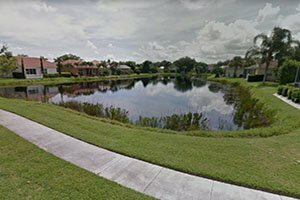 Valencia Lakes is also just east of the townhouses of Mirabella and the villas of Auburn Hammocks. Nearby western neighbors as well are the Sawgrass community and the links of the Capri Isles Golf Club. South across Venice Avenue are the condo units of the San Lino. Valencia Lakes, which was built out around 2014, showcases some of the outstanding builds by local contractors Peterson Homes and Caithness Construction. Prospective buyers touring Valencia Lakes can find many choices of pool homes, and all the residences exude an elegant curb appeal aptly complemented by the community’s well maintained tropical landscaping. The homes for sale in Valencia Lakes are well-platted within its acreage which has been subdivided by internal streets laid out for the most part in an “E” configuration. The two parallel prongs of this layout and the northern edge of the property are astride the lakes trademark to this development and provides water views to many of the residences. Valencia Lakes Boulevard, the property’s main street stretches northwest to a cul-de-sac where community pool with a cabana is located. The other streets in the property—La Palma, Cala, and La Bella Court—are all cul-de-sacs, too, thus minimizing through-traffic within the community for a quieter residential setting. 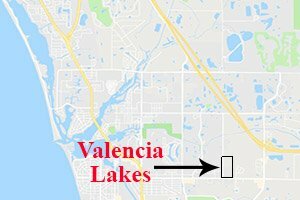 The available homes in Valencia Lakes are typically priced starting from the high $200s up to the $400s. These sales listings’ floor areas measure between 1,700 and 2,200 designed with two to four bedrooms, with the older homes built in the early 2000s. A huge selection of local amenities combines to bring market interest in the homes for sale in Valencia Lakes. The community is walking distance to the Villa Venetia Plaza, a strip mall west of the community with retail shops and restaurants. The commercial hub of Jacaranda Commons, which is just east of the Valencia Lakes homes for sale, has a Publix Supermarket and a CVS Pharmacy. Westward, the points of interest expand to the historic downtown of Venice Island, which teems with venues for shopping and dining as well as cultural activities. Several parks and beaches, moreover, are destinations quite close to this town center. Additionally, the road corridors north and east of Valencia Lakes are gateways to even more life and leisure choices. Interstate 75, one these portals, provides access to northern attractions including those in Sarasota, Lakewood Ranch and Bradenton. As enticing, River Road running east of the community links southwards to the vibrant West Villages master development. Amongst the attractions which have been widely anticipated here is the 2019 opening of a sports complex serving as home of the spring training for the Atlanta Braves, one of the new drivers for the south Sarasota real estate market. Below are the current real estate listings available in Valencia Lakes.